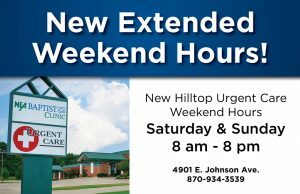 In an effort to provide care when it is needed the most, NEA Baptist Clinic has extended Urgent Care Hours at NEA Baptist Clinic – Hilltop (4901 E. Johnson, Jonesboro). The clinic, which offers Urgent Care Services from 9am – 9pm Monday through Friday, will now be open from 8 am – 8 pm Saturday and Sunday. The Urgent Care clinic may be reached at 870-936-7695. A walk-in urgent care should be used when you need medical care today and feel safe to wait a few hours. Examples may include: twisted or sprained ankles, animal bites, cuts and bumps, migraines, and more. If you are not able to schedul an appointment with your doctor, you may also walk in for flu-like symptoms, simple backache, runny nose, sore throat, earache, etc. Building a long-term, ongoing relationship with a Primary Care physician or APRN can result in significant health benefits, including, more accurate diagnoses, lower costs, staying healthier, trust and referral to specialists. Click here to vist a list of family practice providers that are currently accepting new patients at NEA Baptist Clinic.